National Weather Service map shows the projected track of Hurricane Eugene in the Pacific Ocean. Strong rip currents will continue off the San Diego County coastline Monday and surf as high as 10 feet could impact some North County beaches in the coming days as Hurricane Eugene churns over the waters southwest of Baja California. 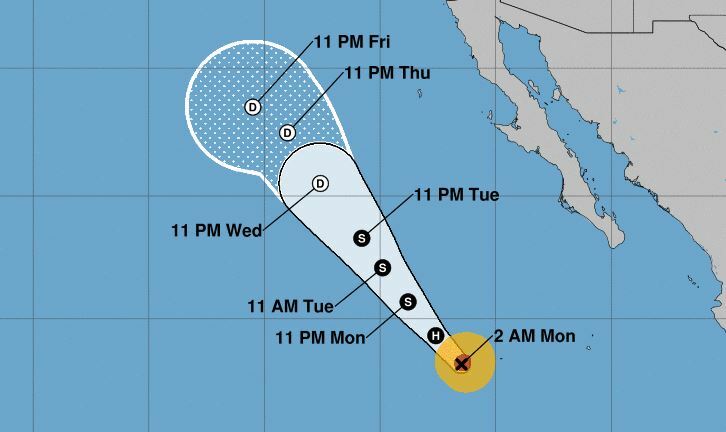 National Weather Service forecasters said wave energy from the Category 3 storm would hit the Southern California coast Monday evening and peak Tuesday night. A beach hazards statement for strong rip and longshore currents will expire late Monday evening and a subsequent high surf advisory, which also warns of potentially dangerous currents, will extend from 6 a.m. Tuesday to 10 p.m. Wednesday. The surf is expected to rise from 4 to 6 feet with sets to 7 feet Monday to 5 to 8 feet with isolated sets to 10 feet Tuesday and Wednesday, according to the weather service. The highest surf is expected along south-facing beaches north of Carlsbad. Forecasters warned that the higher than average surf and strong rip and longshore currents would raise the risk of drowning, especially for inexperienced swimmers. Beachgoers were advised to obey posted signage, speak with a lifeguard before entering the water and swim near a lifeguard.